Break out your fancy pants for these decadent dessert recipes. Weeeee! Cut all fruit into large, bite-size chunks. In a skillet sprayed with nonstick spray (or on the grill if you've got it), grill fruit on medium to high heat for approximately 4 minutes, flipping fruit halfway through. Fruit should be slightly browned on outside, but still firm inside. In a microwave-safe bowl combine yogurt, Splenda, cream cheese and cinnamon. Heat for 45 seconds in microwave. Stir and microwave for an additional 40 seconds. Serve fruit and cheese sauce with skewers or fondue sticks for easy dipping! Serves 4. HG FYI: The recipe method of calculating PointsPlus® values counts the carbs, protein, etc., from fruit, even though fruit has a value of 0*. If calculated without the fruit, each serving of this recipe has a PointsPlus® value of 2*. This dessert is equal parts creamy, flaky, 'n fruity! The fillo dough can be a little tricky to work with, but trust us, it's worth the effort! Thaw entire fillo dough package at room temperature for 5 hours or in the fridge overnight. Preheat oven to 350 degrees. Carefully unravel and remove 2 sheets of dough. Immediately spray both with nonstick spray. Slice sheets into three long pieces and stack on top of each other. Cut once more into two square stacks. Gently place next to one another on a baking dish sprayed with nonstick spray. Place in 350-degree oven for just six minutes. Mix together pudding and cool whip. Remove fillo dough from oven and let cool for a few minutes. Spread half of pudding mix over 1st stack of dough, and place half of the berries on top. Place second fillo stack on top, and spread on the rest of the pudding mix. Top with remaining berries. Share this ginourmous dessert with a friend, family member or dog you like a lot. Fold Cool Whip into pudding and stir until blended. Gently tear or cut each crepe in half. Into the center of each crepe half, spoon 1/4 of pudding mixture. Fold crepes envelope-style, ensuring that there is nowhere for mixture to seep out. Place crepes in freezer for at least 1 hour. Spray a skillet with nonstick spray and set on medium heat. Beginning with the thinner crepe side down, heat for 1 minute. Carefully turn crepe and heat for an additional minute or two. Crepes will be slightly browned 'n toasty on outside but cool 'n creamy on the inside! HG Confession! These don't always make it to the skillet. They're pretty awesome straight from the freezer! 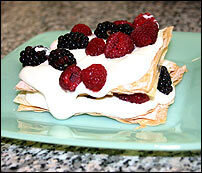 *Nutritionals will vary slightly if garnished with berries. Tomorrow, September 22nd, is the official b-day of the ice cream cone. Celebrate by crunching into one of Skinny Cow's guilt-free versions. Share these INSANE recipes with everyone in your address book. Click "send to a friend" NOW!